Citizen Jack #2 Review – AiPT! Politics are a scary thing. Not just because it’s nearly impossible to become elected unless you have tons of cash, but because the amount of power you can wield does not necessarily have any correlation to intelligence or merit. People can vote for you because you simply have a nice smile, or agree with them on a minuscule issue or because of one action you made when you were younger. It makes you wonder how easy it could be if you have the right circumstances in your favor, which is what this new series from Image is all about. Is it good? Last issue Jack Northworthy was a bum. He sold snowblowers in a town he was once mayor of but was booted out promptly due to corruption. He’s a drunk womanizer and not even close to being fit to running a snowblower, let alone the country. The thing is he has a little demon in his ear shifting things around in order to give Jack the power he so doesn’t deserve. Considering how we’re only a year away from the U.S. presidential election and how often we hear terrible things coming out of those running for president, this series seems well timed. It’s also funny, as it lampoons the election process and the very idea of campaigning. 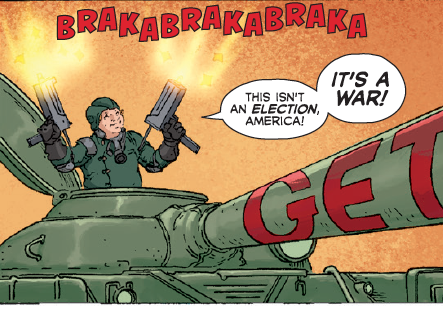 You aren’t getting any politics in comics right now so why not get it from this? Sam Humphries writes a mean demon who’s the perfect amount evil and giddy. The character is obviously having some fun with people and knows he can get Jack in the right place at the right time. Mix this with some good character moments of Jack and you have yourself a compelling story. Jack may not be evil himself—he’s too stupid to hate like a demon, it appears—and we’re getting moments in his past and present that are molding who he is nicely. This is setting the reader up to not know what to expect. Sure Jack wants to be president, but his reasons are weak and his motivations are even weaker. So far he’s doing everything he needs to in order to keep his political campaign semi alive, but due to the character building who knows how he’ll act as things get more complicated. Once again the lampooning of 24 hour news is very well done. The ridiculousness of a talking dolphin on the panel makes it much more hilarious. That dolphin does make one question what sort of world this is since we don’t see talking animals anywhere else, but it effectively turns up the insanity of 24 hour news to 11. When it comes to art I really wish Humphries stuck the demon into every panel for Tommy Patterson because he draws a fantastic monster. One splash page in particular shows the things he can do to your mind and it’s wildly evil and creepy. When Patterson isn’t drawing the demon he’s drawing everything in a detailed Frank Quitely sort of way that gives the scenes weight. You believe everything is really happening save for the dolphin and demon and that helps you envision these things happening in real life— very important aspect in making this book work. I can’t say this is as funny as Humphries intends it to be. It’s mostly plot development and not-so-thinly veiled criticism on campaigns and the 24 hour new cycle. Because there aren’t many laugh out loud moments, the read can get downright boring. It doesn’t help that the major event in this issue could be guessed a mile away. Its strongest element is the character building of Jack which may pay off in the end. The demon and general premise is strong, but this issue drags on since it’s really not funny enough to sustain the commentary. That said, this is a diabolical political commentary that should be noted now that we’re in the heat of campaigns and their forthcoming buzzwordyness.